This week we will be discussing the importance of having alternative water treatment options for short term emergencies. 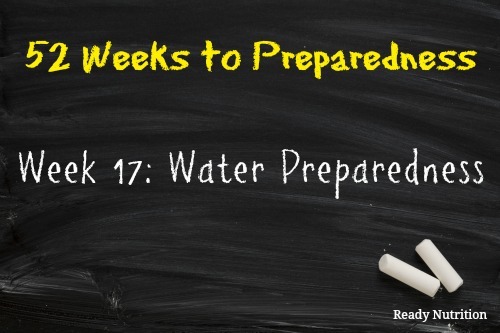 Water is the foundation of life, and as such, water preparedness is one of the most important aspects of being prepared. Disaster officials suggest the importance of having a 3-day water supply, equating to one gallon of water per person, per day. However, in the event of a natural emergency such as a hurricane or tornado, water can be interrupted for days or even weeks. Without water to drink, dehydration sets in, the body starts shutting down and then … well it isn’t good. Let’s just say that a human can die in 3 days without any water or if the water is not treated properly. Water is essential to life, so why not be prepared. Keep some alternative water treatment sources on hand in case of a water shortage. If you want to learn about alternative water treatment options, scroll down to the “Preps to Buy” section of this newsletter. Along with learning about various treatment options, store bottled drinking water for short-term emergencies, and consider having multiple alternatives on hand to treat water and to filter it if a short-term emergency is extended. Most preppers believe in the rule of 3, have three alternatives. I recommend having three different types of water treatment options in case one breaks or is lost. Another way to do this would be having separate filtration systems for the home, for the 72-hour bag, and in emergency vehicle kits. In addition, keeping extra filtration parts on supply would be very proactive in the instance that a short-term emergency extends into a longer-term emergency. Treating the water will eliminate any microorganisms and the possibility of contaminants in the water. Microorganisms such as protozoan parasites, bacteria and viruses can make a person very ill. Drinking contaminated water can even cause death in extreme cases. In a disaster where water sources are compromised, people within a 50-mile radius could be adversely impacted by illness and disease if just one person incorrectly handles water or incorrectly disposes of waste. Learning how to handle and treat water before an emergency occurs will ensure that your family does not become ill from poor water conditions. Water is only as safe as it’s source. When their is any doubt about the quality of water you are drinking, treat it chemically, through distillation or through the boiling method. To learn how to treat water using these methods, click here. Store emergency water in a cool, dark place in your home, each vehicle, and your workplace. Water can be stored indefinitely, but if it has a cloudy appearance, treat it accordingly. It’s possible to keep water in food-grade containers intended for water storage. Containers must be thoroughly washed, sanitized, and rinsed. Only store clean, ready-to-drink water. Tap water will probably need to be purified. Ask public health authorities or your water provider whether tap water should be used and how to treat it. Plastic soft drink or food grade plastic containers can be used in a pinch. Ensure that the containers and cleaned and sanitized thoroughly before re-use. Note: Do not use milk or juice containers for storing water. Even if you try to thoroughly clean these plastic containers, left over sugars and proteins provide perfect places for bacteria to grow. Water is a finite resource, and in the case of emergency preparedness, it is one of the most important items to have stored. We use water for everything: hydrating our bodies, cleaning our bodies, brushing our teeth, for cooking, cleaning the dishes, and cleaning wounds. Ensure that you have enough for these purposes. 1. Research different types of water filtration systems to see which type is best suited for your family. Some great websites to begin searching is Berkey water filtration systems, Katadyn water filters, Micropur tablets and Steripen. These are all products that I have in my own preparedness supplies and use regularly. 2. Learn about natural ways to filter water. You Tube is an abundant source of information on how to filter water for survival situations. Devote some to learning methods such as: how to build a solar still, how to live on sea water, how to make your own water filter, making a sand filter and/or gravity filters. 3. Practice filtering and treating your water. This is a crucial skill to learn! this was an excellent read for me. I had no idea water “expired”. Makes me think I don’t have as much water as I thought I had, due to some containers being over a year old. A word of caution: I’ve had issues sevral times with 1-gallon water jugs failing and leaking. They were not abused, just bought at the store and sat on a shelf and within a few months they leaked. Store your water UNDER your other stuff, not above it, and make sure it comes in containers you can trust. The ones that leaked looked like milk jugs, but with water instead. Yes! That is such great advice. Let me also add that there are times when those jugs of water can get small holes in them and slowly leak. Before you know it, you have a mildewed floor. So make sure that your water is stored in an area that can withstand leaks too (i.e. off carpet). Again, great advice and thanks for posting! Seriously, I see no date on the bleach bottel, it still smells and looks like bleach??????????????????????? Hey if you have a swimming pool you have a ready supply of water all you need to do is filter it to drink. IF you DO NOT have a pool it just may be time to buy a small above ground pool, treat it with pool shock and cover it till you need to drink it. It will cost you a couple hundred dollars but it will be a very worth wile investment TRUST ME!